Two Trends for under 20 bucks! I am not a huge trend follower. As I have gotten (ahem…) older, I take more time interpreting the style to what I feel most comfortable with. 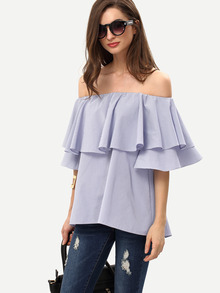 I love the “off the shoulder” trend, but knew I didn’t want to spend a fortune. When I found this cute top on the Shein website, I thought I would take a chance! I had never ordered from them, but the reviews on this particular top were all very good and helpful when it came to choosing a size. When this top arrived I was pleasantly surprised. 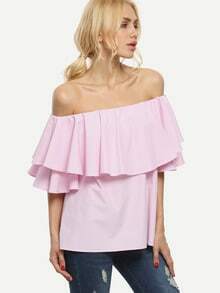 It is a nice weight material, so the ruffles hang just right, it actually stays off your shoulder comfortably, and for just $15 it’s a great buy! I’ve linked my top and a couple others at the bottom of this post! The long tassel necklace is another trend I’m loving too!! I really hadn’t shopped around, but the other day I was at Walmart and found this little beauty for …..$5!!! (not kidding!!) It’s one of those pieces that you wear once and instantly know you’re going back for another! 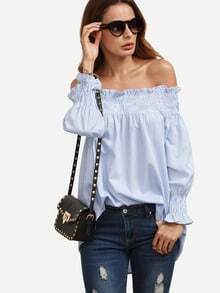 So, what do you think of the “off the shoulder” trend?? Gorgeous!! elegant!! Timeless!! 💯💯Love having likes and comments on my newest posts! Thanks in advance and keep rocking it! !